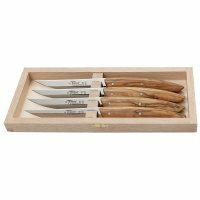 Handle scales made of olive wood with honey-coloured grain. The wood has excellent properties and has therefore been regarded as a valuable material for many centuries due to its warm colouring. 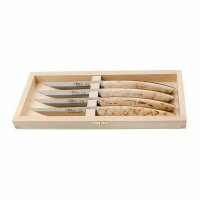 Thanks to their low weight, these elegantly designed knives fit comfortably in one’s hand. The double bevel edge made of rustproof X50CrMoV15 steel* is polished to a mirror finish and achieves a hardness of 56 HRC. Comes in a locking case made of beechwood. 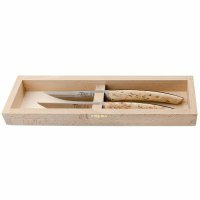 The company was founded in 1902 by Blaise Dozorme in Thiers, the knife capital of France. This family-run company combines traditional craftsmanship that has been passed down through the years with modern manufacturing technology. 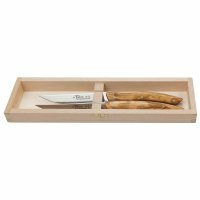 Thus, the range includes both traditional folding knives as well as new interpretations of regional knives. Even cutlery and flatware for the table are offered.